Use our electricity usage calculator to calculate the energy consumption cost of your various electrical appliances and devices. Find your Electricity Cost in KWH. To use the calculator, get out your electric bill and find what your electrical company charges you for Kilowatt Hour (KWH). Enter that value in the "Kilowatt Hour Cost" box. Enter Wattage of the Device. Next, enter the wattage of the device in the 'Wattage of Device' input box. Finally enter the number of hours per day that you will be using the device and press the 'Calculate Cost' button. You can also select a known device from the dropdown at right, and press "Select Device and Calculate". 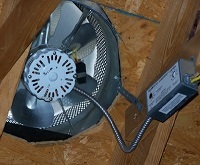 Install an attic fan to save on air conditioning costs. Copyright 2008-2015, Spectrum Research, Inc.